The Commerson’s dolphin has one of the most unusual appearances of all the cetaceans. This relatively small dolphin is a stunning sight in the animal world. 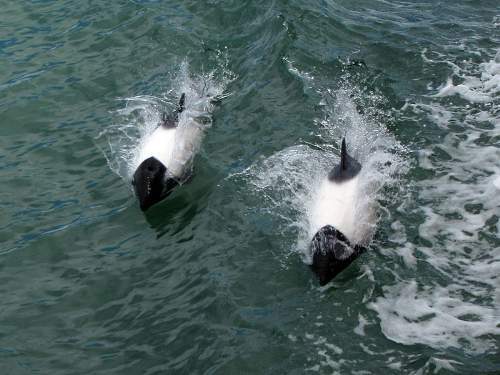 One of the most instantly recognisable features of the Commerson’s Dolphin is its unique black and white colouration. The white is their predominant colour with the head, dorsal and pectoral fins – along with their tail fluke being black in colour. The Commerson’s dolphins have short, relatively stocky bodies. Unlike ever other single dolphin, they possess no beak or rostrum. It is easy to tell males and females apart. In the case of males there is a black marking on their stomach that forms a tear-drop shape. In females this marking has a more rounded appearance. Commerson’s Dolphins are quite the varied eaters. They feed on squid, crustaceans and fish. Somewhat unusually for cetaceans, they also feed on plant matter and have been known to have algae in their stomachs. Whether this is accidental ingestion or not is another matter. The Commerson’s Dolphins are thought to generally form small groups of up to three individuals. Though pods in excess of 100 dolphins have been witnessed by onlookers. These dolphins are very adept swimmers and are both fast and highly manoeuverable. Leaping out of water and quick-turns are also some of the activities these creatures have been noted to engage in. In the 1970’s and 1980’s Commerson’s Dolphins were captured by Argentinian and Chilean fishermen and used to provide bait to catch crab. This practice has been greatly limited especially when the animal was put on the Red List Of Threatened Species. 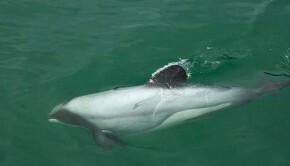 Pollution and accidental fishing are two of the main threats to the Commerson’s dolphins as well as the capturing of the species for entertainment purposes in aquariums. Commerson’s Dolphins are up to 1.7 metres (five and a half feet) in length. They can weigh as much as 86 kilograms. Commerson’s Dolphins are found off the Southern coast of South America and the Kerguélen Islands half-way between Antarctica and Africa. They can live to be up to 18 years. Visit Wikipedia for more information on the Commerson’s Dolphin. Check out Yellow Magpie’s Our Love Affair With Our Favourite Cetacean, Fin Whale: The Giant Speedster Of The Oceans and The Whales: Kings Of The Cetaceans for further insight into Whales and their cetacean cousins. Among Giants: A Life With Whales is the fascinating story of underwater photographer, Charles ‘Flip’ Nicklin. Full of splendid pictures and insightful commentary about the whales this book is stunning. You can obtain Among Giants: A Life with Whales here from Amazon. For people living in Ireland or the United Kingdom, you can access: Among Giants: A Life with Whales from here. For Canada: Among Giants: A Life with Whales . For Germany: Among Giants: A Life with Whales . For France: Among Giants: A Life with Whales .